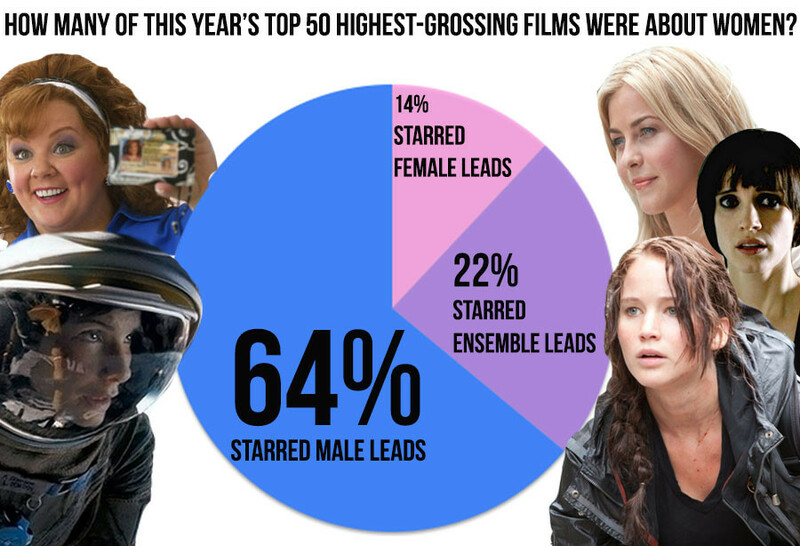 In November, the New York Film Academy took a look at gender inequality in films from 2007 to 2012. The results were startling: there five men for every one woman working in the industry. As the year comes to a close, we decided to take a closer look at the films of 2013. Adding up the leading roles in this year's 50 highest-grossing films (as listed by Box Office Mojo), we tallied how many featured a female lead, how many featured a male lead, and how many included a co-ed ensemble cast. The results: Not only are women -- as the New York Film Academy found -- less prominent in the film industry, the movies that garner the most attention rarely focus on female narratives. Of this year's 50 top-earning movies, just six starred a female lead ("The Hunger Games: Catching Fire," "Gravity," "The Heat," "Frozen," "Identity Thief," "Mama" and "Safe Haven"). More than 32 of the movies among the top 50 starred only male leads and 20 percent of the total films did not even include women as secondary characters.